A Single, Easy-To-Oversee Numerology Chart Designed For Professionals and Beginners. 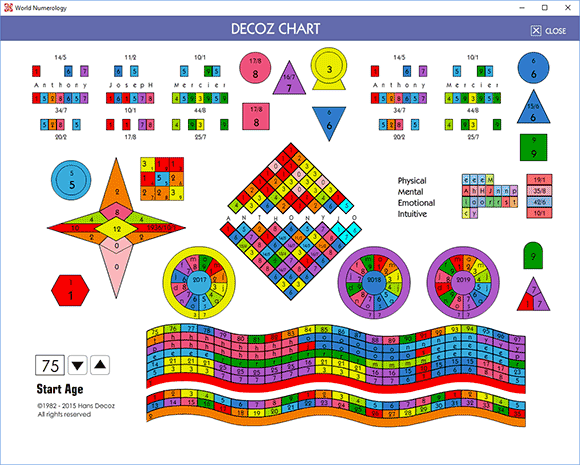 This unique charting system was first designed and developed by Master Numerologist Hans Decoz in 1982. In 1987 a program was written producing charts by pen-plotter. 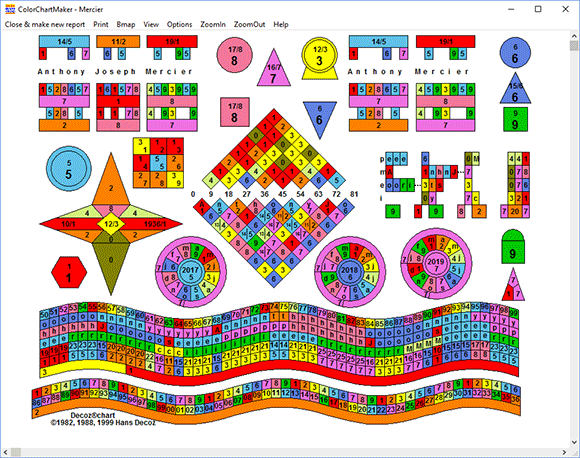 This was subsequently replaced by a C++ version in 1990, and in 2016 included in our free World Numerology Collection. The layout is simple and logical. The numbers and aspects of both the full name at birth and the name the person goes by take up the top part of the chart. The middle part is used for the date of birth, the Diamond, the Planes of Expression, and other aspects. The lower part of the chart (the wave), shows all the relevant cycles. Each column represents one year. The upper part of the wave shows the cycles based on the name (Transits and Essence cycles), while the lower part reflects the Personal Year and Pinnacle cycles. The new version included in the World Numerology App lets you change the age, allowing you to view all the cycles from birth to death.